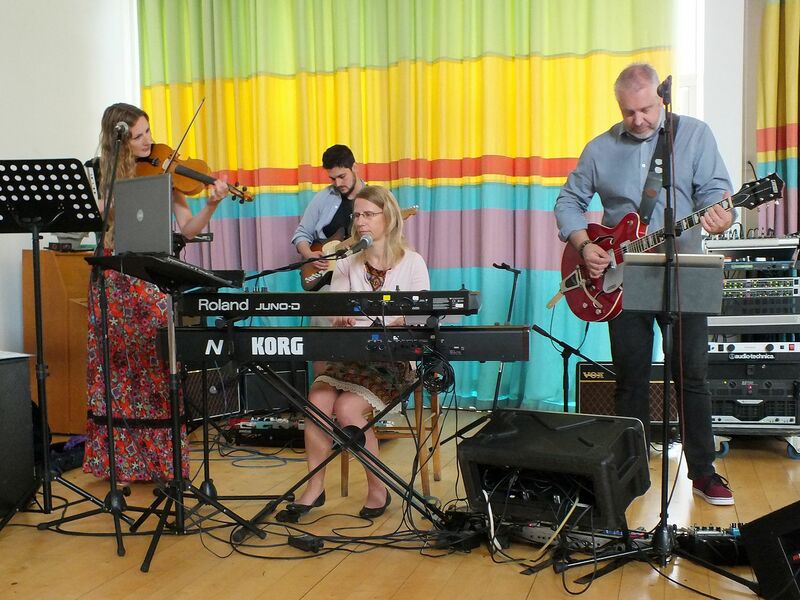 Each Sunday we have our all-age “Worship & the Word” Sunday morning service, starting at 10:30am and finishing around 12:30pm – with a time for fellowship and refreshments afterwards. We start the service with a time of open sharing and encouraging each other with opportunities that God has given us to share the gospel during the week – very much like Paul did upon returning to Antioch after his journeys; “And when they were come, and had gathered the church together, they rehearsed all that God had done with them, and how he had opened the door of faith unto the Gentiles” (Acts 14:27). 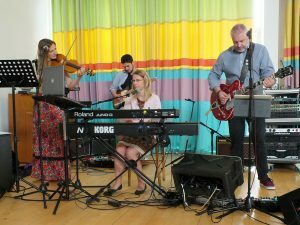 This is usually followed by time worshipping our great God & Saviour using modern praise & worship songs as well as more traditional hymns, led by the Calvary Portsmouth Band. After our time of worship, we often have a brief prophecy update, looking at current world events in the light of Biblical prophecy, followed by either a ‘verse for the weak’ or reading from the book of Psalms. 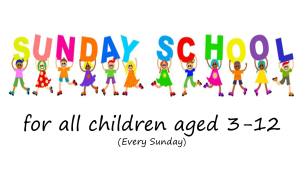 The children 12 years or under then go to their own study and activity classes (see our children’s ministry page), whilst the ‘grown-ups’ stay for a time of Bible study. To start 2015 we had two mini-series; starting a 3-part study on ‘love… a more excellent way’, and then a 3-part study looking at ‘The Promises of God’. From February to October we journeyed through the Books of 1st and 2nd Kings, looking at the end of David’s reign, through to the exile of first, the Northern kingdom of Israel to Assyria in 722 B.C., and finally the exile to Babylon in 587 B.C. In November 2015 we moved into the New Testament for a verse-by-verse study through Paul’s letter to the Galatians. In 2016 we embarked on a verse-by-verse through the Book of Revelation – particularly timely given the rapid changes in the world. We now have a Pope who is effectively calling for a one world church (see the shocking ‘Pope’s Prayer request’ video stating that Christians, Jews, Muslims, Buddhists – and quite frankly anyone else – are all worshiping the same God! https://www.youtube.com/watch?v=Nq7us5Lf5IU). In certain countries, experiments are well underway to do away with cash, and we have the World bank moving us closer to a single financial system for buying and selling. It is no secret that plans for a one world government are no longer just the on the lips of Bible prophecy students – these things are happening before our eyes. Last year (2017) we began a verse-by-verse study through Genesis – the foundation of the entire Bible – which we will conclude in Jan/Feb 2018. In 2017 we also had some great topical teachings from Simeon Forder (Deal Christian Fellowship), Ilir Begaj & Adrian Hudson (both from Calvary Portsmouth), and Simon Turpin (Answers In Genesis). If you live in the Portsmouth area, please come and join us. If not, we’d love for you to join us via the web and pray that you are blessed by our studies – usually uploaded each Sunday evening. We also make available the Powerpoint slides used in the teaching (which helps save writing copious notes!). As always, we urge you to be Bereans, who we read about in Acts 17:11, who received the word with all readiness, but then searched the scriptures daily to see whether those things were so! We would also ask for your prayers for this ministry, as we seek to remain always obedient to our LORD and Saviour. During the service, there is a crèche available for parents with children under 3 years of age, with an audio link provided. Please feel free to join us as we study God’s word and sing our praises to Him!